Yesterday was Costume Showcase, thank-you to all the family and friends who came along. The 2 shows were sold out by Tuesday which is great (although not so great if anyone left it too long to buy a ticket). 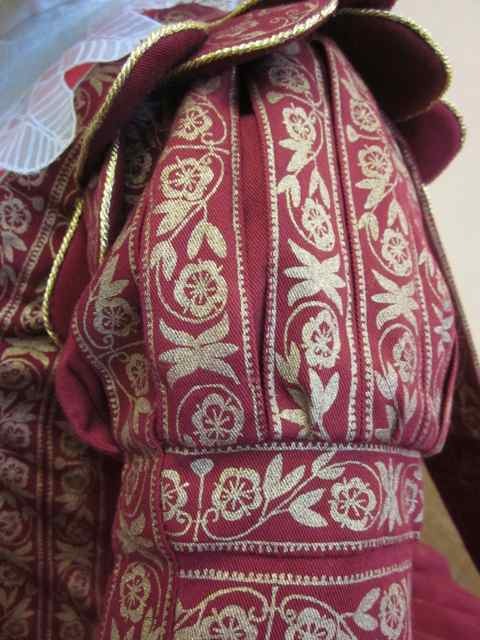 This post is a photo essay of the order which the garments are put on. 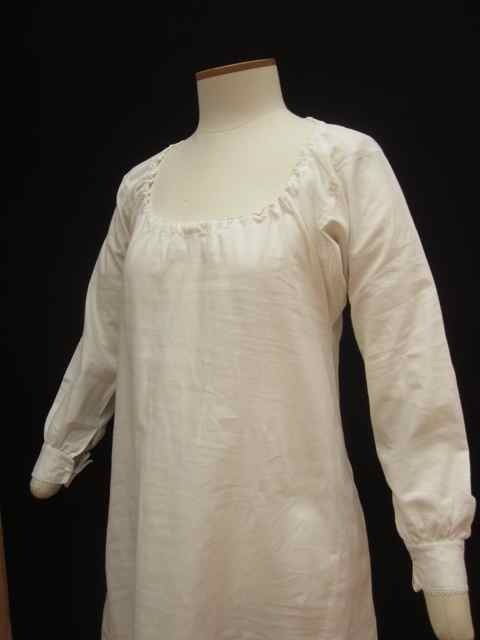 The above item is the shift or chemise. It would have been worn to keep sweat off the more expensive dress. It is easily washable. 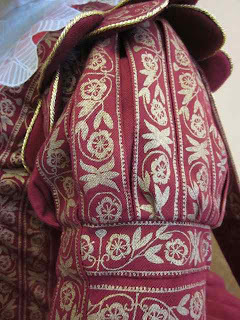 It is a very basic shape with a gusset under the arm and a drawstring at the neck. 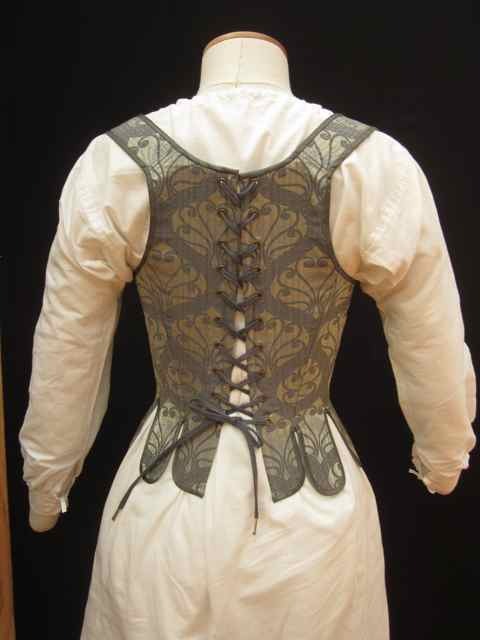 This is the corset from the front and back. I made it out of some fabric I found in Warehouse Fabrics in Wellington ages ago. I don't really know the fibre content. Then the bumroll gets put on and this holds up the back of the farthingale which holds the skirt out and slightly tilted. 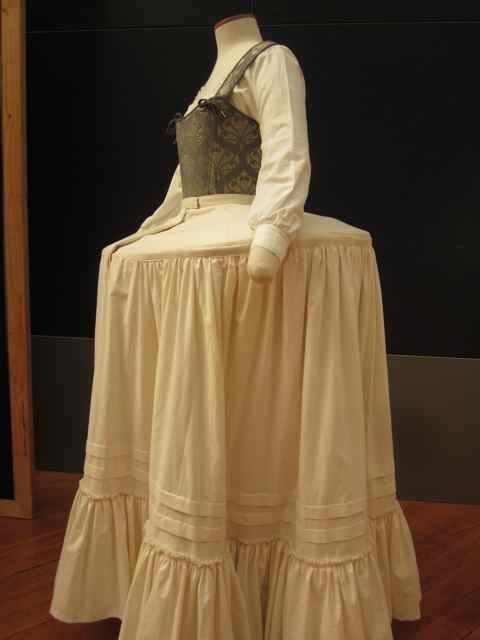 In the photo the skirt is very tilted up at the back but this maybe because the Countess is sitting. 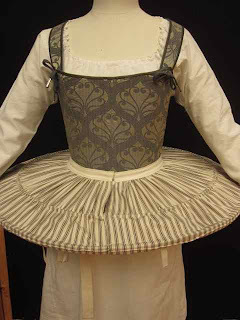 Then the farthingale which is made of mattress ticking fabric. 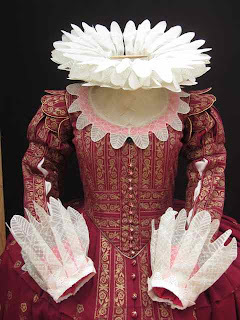 The Farthingale is the predecessor of the ballet tutu I'm told. Then the petticoat which is made of 2 layers. The top layer has gathers and the bottom layer has box pleats. It is really heavy and stops the skirt from caving in when the wearer walks around. 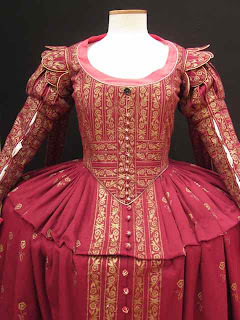 The dress. 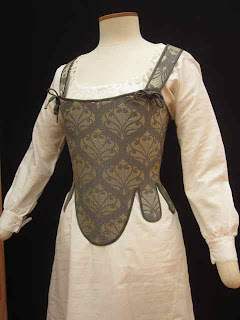 This was made as separate bodice and skirt. I started with the skirt because that seemed easiest and then did the bodice when I had learned a few more techniques (such as boning a bodice and making the pattern fir the wearer!) The patterns are all screenprinted with 'Bright Gold' ink from CCG in Auckland. 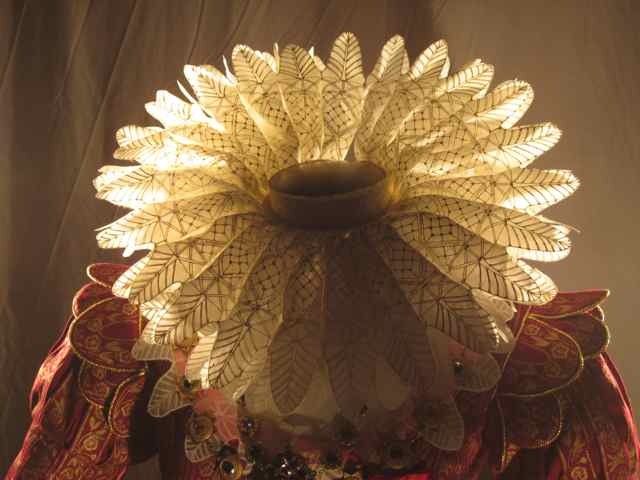 Bright gold is a metallic gold and this glittered in the theatre lights. The sleeves were the hardest bit. 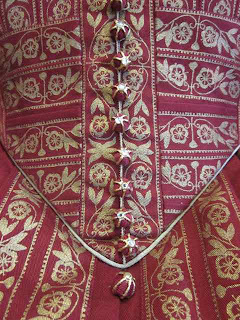 They have an under sleeve which is slit at the front so the chemise shows through, then they have a pleated puffed top part with a narrow ribbon like hanging sleeve and epaulettes. I had to do some incredibly carefully placed screenprinting to get the patterns in the right place. 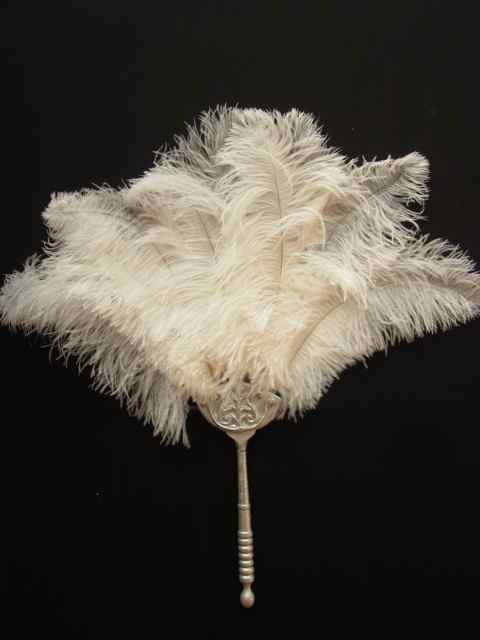 Then the ruff and cuffs. The ruff is made of very fine screenprinting mesh which is printed with cream opaque screenprinting ink. The cuffs and lace around the decolletage is printed onto silk organza. The reason for the different fabric is that the ruff needs to be washable as theatre makeup gets onto it and it is the wrong shape to wash and iron easily. 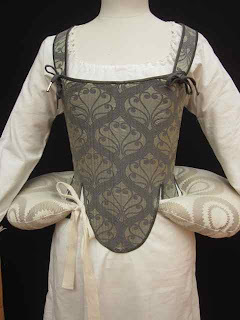 Tudor/Jacobean washer-women used to unpick the stitching them wash them and remake them. The cuffs are organza to be more see through and can be more easily washed and ironed. 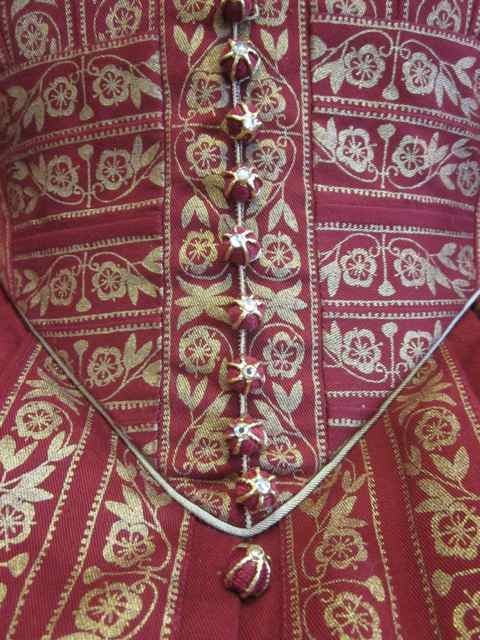 Above is a detail shot of the bodice showing the buttons which I made by hand. They are thread wrapped around a single bead. Then they have plexi glue on the spines and gold foiling on that and a single rhinestone in the centre to make them glitter. This is a nice shot of the ruff showing the screenprinted 'lace'. This didn't show very well on stage but looks good close up. 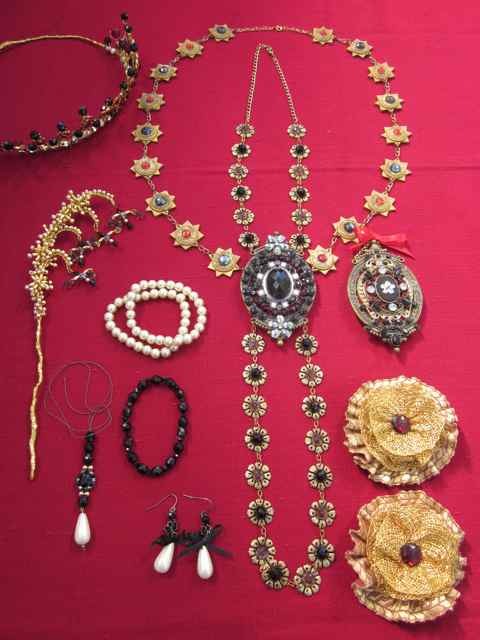 Then all the jewellery. I used bead caps, op shop brooches, $2 shop pearls, wire, beads (thanks to my cousin Sue for quite a lot of these). 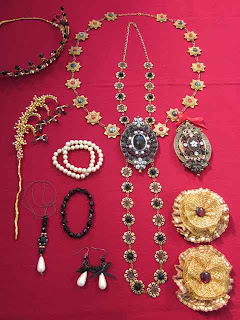 There is a lot of glue involved in making these jewels. Lastly she gets her fan which is made of a wooden spoon handle, a base which I cut from customwood and the design was cast in a mold I made in the Special Effects class.